Are you in need of a reliable septic plumbing service in the Winston-Salem, NC area? Here at Transou's Forsyth Septic Tank Service, we take pride in being one of the Triad's leading septic system installation, repair and service companies. We offer fast and friendly septic system service. We also specialize in tank inspections and grease trap pumping. We have a grade level 4 certification and have a certified inspector in house. If you have a party or special event coming up, ask us about our portable toilet services. 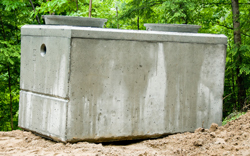 Transou's Forsyth Septic Tank Service covers your septic needs for everything from septic installation to septic plumbing. Family owned and operated since 1952, Transou’s technicians offer fast and friendly septic system service. Transou’s also rents portable toilets for residential and commercial use. Our knowledgeable crew is ready to handle your emergency or to assist you with the planning, septic installation and maintenance of your septic plumbing system. The skilled technicians are always dependable and efficient, ready to share information and answer any customer questions that may arise. We specialize in septic system installation in Winston-Salem! Transou's Forsyth Septic Tank Service is committed to customer service. With over 60 years of experience, you can feel confident that the work being performed is designed and sized to fit your needs, installed properly and meets the state and local guidelines. Transou's Forsyth Septic Tank Service trucks are clean and safe. The technicians are state licensed, hold a grade level 4 certification and are insured. Your property is important, and the crew at Transou’s makes every attempt to leave your property as it was when they arrived. This is also true when dealing with portable toilets. Transou’s will deliver wherever needed and maintain the units so they are clean and well-stocked. Whether it’s a construction site or a special occasion, you can count on Transou’s to provide top quality service and dependable products. Trust us to take care of your septic system! Transou’s can provide information and installation for conventional septic tanks, drain fields, septic pipes, and septic waste handling. They are capable of working with alternative septic system designs for problem sites where the need is to save water or where it is difficult to dispose of septic waste. Our office staff is friendly, professional, and well-equipped to handle all scheduling and dispatching situations. Transou's Forsyth Septic Tank Service can design and install all types of septic systems, including mound systems, drip irrigation and modified mound systems. These systems meet or exceed EPA standards for commercial properties and Department of Health regulations for residential properties. They can also design and install no-dig trenchless systems. 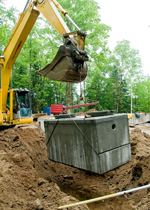 "Septic tanks" are what homeowners or home buyers think of when buying/maintaining a home with a private septic system, but it is actually the whole septic system that Transou’s is concerned with – since the drain field or leach field makes up half of a typical septic system cost. Septic tank care and septic tank cleaning need to be done on a regular basis to avoid ruining the drain field. Did you know about 25% of the U.S. population relies on decentralized – or onsite – waste water treatment systems? About 95% of the onsite waste water disposal systems are septic tank systems. 1. Do not drive cars, trucks, or heavy equipment over the absorption field. 2. Do not plant trees or shrubbery in the field area because the roots can grow into the lines. 3. Do not pave over the absorption field with concrete or asphalt. Grass is the best cover. 4. Divert surface runoff water away from the absorption field. Chemicals in paints, varnishes, thinners, pesticides and other materials can contaminate surface and groundwater, and should NEVER be flushed down toilets or disposed of down a drain. For more information on how to maintain a safe environment around your household, call Transou's Forsyth Septic Tank Service now!